Bring the Mickey Mouse Club House to your next event! 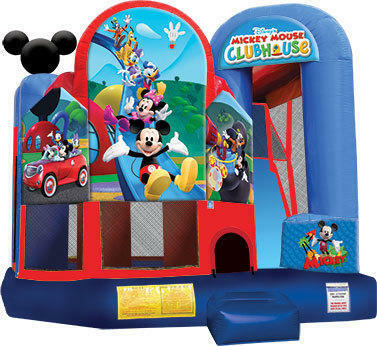 This licensed Mickey Park Combo bouncy castle will bring friendship and activity to all players with its trademark Mickey ears on the top of each tower. Colorful digital artwork features Mickey and Minnie, Daffy and Daisy, Goofy and the trustiest dog in Mickey Park, Pluto. Kids can run and jump for hours with all their favorite characters. This bounce house combo offers up to four different activities for endless hours of activity. Each bouncy castle has a interior jumping area and a basketball hoop for group interaction and Slide.